Amerzone (also known as Amerzone: The Explorer's Legacy) is a first-person fantasy graphic adventure game published by MicroÃ¯ds and designed by BenoÃ®t Sokal, who based it on his 1986 Inspector Canardo comic strip L'Amerzone. 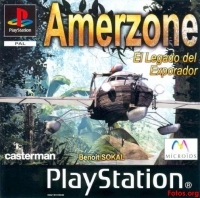 Amerzone was originally released for Windows, Mac OS and PlayStation in 1999, and re-released for iOS and Android in 2014 by Anuman Interactive, whom had bought out MicroÃ¯ds in 2009. Like the comic, the game tells the story of a French explorer, Alexandre Valembois, who goes on an expedition to the mysterious South American country of Amerzone. There, he discovers many fantastical animals including a species of magical White Birds, who require human intervention for their survival. These become threatened when a friend of Valembois turns Amerzone into a brutal dictatorship, and Valembois endeavors to rescue the endangered species. The game adds a journalist as the player character, who continues Valembois's quest as the man nears death. Amerzone received generally positive reception. It was praised for its atmosphere and visuals, with critics claiming that it lent it a poetic and dreamlike quality; while criticism targeted the sound, controls, and difficulty. It was a great commercial success, with over 1 million copies sold in its original release.